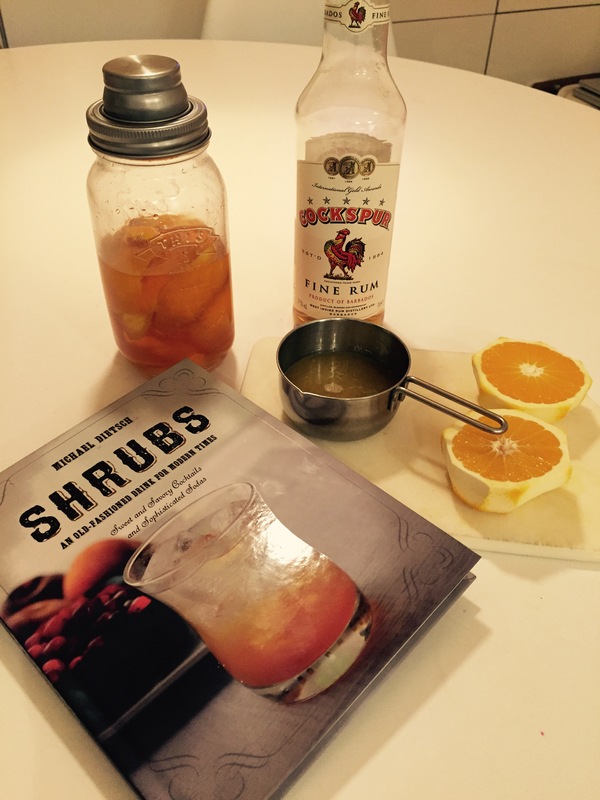 I recently added Michael Dietsch’s book, Shrubs, to my collection of drink books, this being a history of two distinctly-different styles of drink that share the same name and most likely a common ancestor in the middle Eastern sherbet, a combination of fruit flavours and sweetening to make a refreshing drink. The first style of shrub is the older English combination of citrus and sugar, steeped in alcohol, that developed when this country opened up trade with the caribbean and citrus fruit, rum and sugar became more available. The other shrub is a vinegar-based fruit drink that came out of the early colonial period in America, presumably using the antiseptic and preservative properties of vinegar to preserve the fruit ingredients of the drink. I wanted to make one of the older, English-style drinks based on rum & sugar, so settled on a recipe from Dietsch’s book that came from the papers of Benjamin Franklin, one of the most famous founding fathers of the U.S.A. He was a remarkably talented man who crossed the Atlantic nine times in his amazing life – no small achievement when this meant an arduous journey by sail. America, as a trading colony, is reflected in the recipe – simply sugar, combined with rum and oranges, and left to steep for several weeks. Unlike Franklin’s recipe, which runs to gallons and quarts of ingredients, I made a smaller batch: half a cup of sugar, two oranges & half a bottle of rum. The method is simple: Firstly, juice the oranges, and combine with the sugar. Then, in a bottle, combine the peel from the juiced oranges with the rum and leave overnight. The following day, remove the peels, and add the sugar/juice combination to the rum and shake to combine. The mixture should then be left somewhere cool and dark to mature for 3-4 weeks. My mixture went into the bottle at the weekend, so will be ready sometime around the beginning of March.